Donna’s next stop with the company of Chin Chin was in Boise, Idaho on December 4th to the 7th. The Idaho Statesman ran many agent supplied articles and advertising for the show. Articles began in the “What Boise Theatre Managers Say About Coming Attractions” on November 23rd. 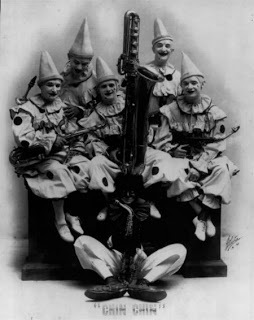 It begins with a photo of the Famous Clown Band and continues with a short article. “To Walter Wills and Roy Binder are are entrusted the principal parts, supported by a company of clever comedians and a beautiful chorus, In their songs. “The Chinese Honeymoon,” “Go Gar Sig Gong-Jue” and “Temple Bells,” the two clever comedians, Wills and Binder, make a decided hit and are always recalled again and again. In this charming fantasy with a Chinese atmosphere there are also a score of other songs that are the fascinating, whistling kind, and several unique dances that carry the snappy comedy along delightfully. In the November 27th paper we learn that Ethel Lawrence plays, “Violet Bond,” the rich American girl. mn ad. The ad reminds us of just how big the show was, particularly for a road show. At the Pinney Theater, Boise, this was “the biggest show in years.” The show had “two car loads of scenery.” We need to remember in 1919 they were referring to railroad cars. The company was huge, 65, including 40 girls. Repeat 40 girls and 35 men back of the scenes. I don’t know if they just couldn’t count or what, because 40 plus 35 is 75 in my world. We knew there was a circus in the show with a horse that Mademoiselle Fallofski tried to ride. We also learn of a ventriloquist show. A list of some of the songs in the production is also included. We are reminded that ticket prices were low, from $.50 to $2.00, there was a whopping 10% war tax added to the ticket sales. World War I economics were staggering. Federal Expenditures increased from 1.3 billion in 1916 to almost 16 billion, over 1000%, in two years. (1) To pay for the war the government enacted many new taxes. I think that calling it a “war tax” was really good. I wish taxes today were as clear. Certainly, we know how much our social security and medicare taxes are, but everything else is sort lost in the general economy. I wonder if we had a “war tax” today, would we have quite so many wars. 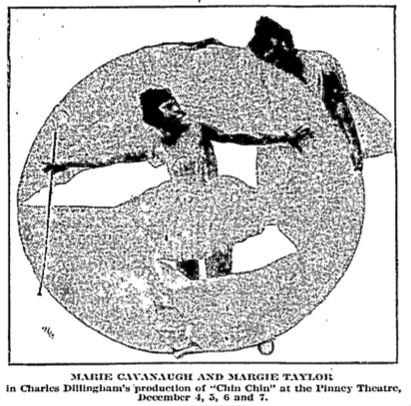 On page 10 there was an interesting picture of Marie Cavanaugh and Margie Taylor, whom we haven’t see mentioned in advertising before. Because of the grainy nature of the image I could find, I just can’t tell exactly what they are doing. I have been unable to find a higher quality photo of it elsewhere. It would be interesting to find a better photograph of them in this role. “Not for years has there been such a riot of artistically harmonized, faultlessly blended color upon any stage as Charles Dillingham’s production of ‘Chin Chin,” coming to the Pinney four days, December 4, 5, 6 and 7, Thursday, Friday, Saturday and Sunday. “A flash of burnt orange trailing off into crimson, and we have a tea shop in Pekin. A splendor of apple-green, bronze-green, dull blues and bright blues, and a Chinese Bazaar filled with quaint toys and curious idol images, swings into view. A shimmer of moonlight on porcelain walls and among cherry branches at bloom-time and a place terrace rises slowly into sight. Presto! and we are on the outside of the dressing-tent of a great circus. All flapping canvases and posters of gaudy hue. Presto! and we smell the sawdust. A beam from Aladdin’s ‘lamp’ and all is romance again, the romances of trees and flowers and vistas of a park. “Nor does the shifting scene contain all there is of color. There are costumes of every primary tint and every pastel shade, flaunting vermillions, lurid yellows, vitreous greens, great splashes of purple, subtle lengths and ripples of pink and azure and violet — an iridescence, a play of pigments that astonishes the eye. The Idaho Statesman has an interesting article on page 8 of the December 2nd paper. We knew from other papers that the Chin Chin group played in Twin Falls, Idaho on December 1st. We don’t know where the company was on December 2nd. But, on December 3rd, part of the show was 20 miles west of Boise in Nampa, ID. The Joseph Murray Post of the American Legion, which was 70 members strong, put on a smoker (boxing match) that also included, “vaudeville from the Orpheum circuit, and dancing by the girls playing in Chin Chin.” We don’t know if Donna was with that group, but I would like to think she supported the Legion and their promotional activities. Another article, this time published on December 5th, indicated that the program was a success with approximately 200 returned soldiers, sailors and marines attending. The newspaper had a very interesting release on December 4th. 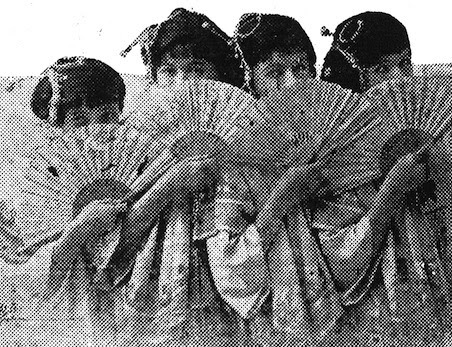 “In the chorus of “Chin Chin,” to be seen at the Pinney on Thursday, Friday, Saturday and Sunday, there are 30 girls. More than two-thirds of these girls have never been seen either here or in New York. “By an arrangement that was made with a talking machine Company, out of town applicants for positions in the chorus who were unable to go to New York, where the engagements were made, had their voices recorded on disk records at the various agencies, and the same were sent to Manager Charles Dillingham for consideration. All of the applicants wrote that they were anxious to begin their stage career under his direction. “The competition lasted for two months, and those selected were given contracts and were notified to be ready for rehearsal. 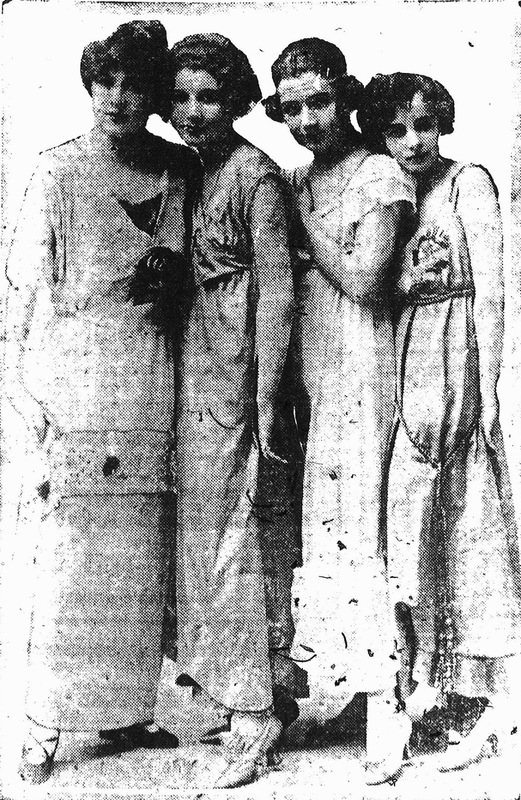 “By this means Charles Dillingham believes that he has secured a unique chorus, well chosen for voice and beauty, the engagements being unprejudiced by any personal reasons. From that note, it appears that “Chin Chin” may have played in Burley on the 9th. I was able to find the Burley newspapers from that period are available via interlibrary loan. I’ve ordered it and will see what it show. This is important because I am not finding the Chin Chin show anywhere until into February 1920. In 1892, James A. Pinney build the Columbia Theatre. 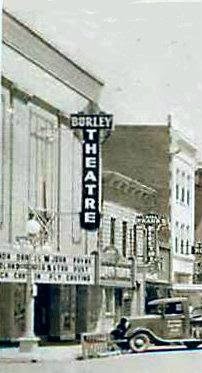 In 1908 the Pinney theater was built on the same site. It was an ornate theatre designed for stage. In the 1920s it began the shift to primarily movies. On February 20th, 1940 they hosted the world premiere of “Northwest Passage” which was filmed at McCall, Idaho, which is about 100 miles north of Boise. The Pinney was demolished in 1969 and is a parking lot today. 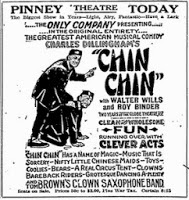 Did “Chin Chin” play in Burley on December 9th, 1919?